So here is what we did get done. Dan cut out the drywall that was on the top of our closet. I held the vacuum to catch the dust. See how helpful I am? ;) Then he cut down the left side wall to make it flush with the existing closet wall. (Vacuum girl was on top if things again) Our end game here is to make a rectangular recess for our butler’s pantry so some walls needed taken out and some needed adding to. See this? This is what you call an unexpected whoopsie. After we took the part of the closet wall out that used to make an L, we realized that we now had a nice hole where our flooring should be. Yikes. Dan was going to cut out the wood that will sit under the cabinets anyway but now we will be mending these floor boards as well. Always something! That takes us to the wall on the right. Dan built a frame in the new wall over there. We needed to build that wall out just a bit so that the cabinets would fit properly. . He took some scrap wood we had in the garage from another project, and attached it horizontally to the vertical studs to make a frame to connect the drywall to. Once that wall was opened up and I realized there was an outlet on the other side…. I asked Dan to add an outlet to the pantry as well. It was easy peasy and he was happy to do it! If you watched my stories on Instagram you will know that he rolled his eyes at me when I asked if that was hard. Such a DIY snob! Haha! That’s my Danny! DIY superstar! After we built the frame and all of the dimensions were correct, Dan attached the drywall. So we are starting this next week with a nice little recessed space- ready for some cabinets and open shelving! The cabinets arrived this week, so we will be customizing them and getting them ready to install! Should have some really great progress to share with you next week. As always, thanks for following along. It means so much to me!! 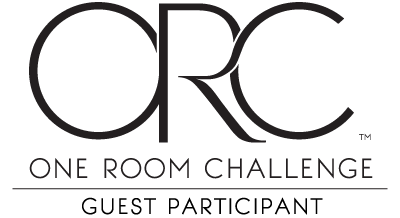 Be sure to check out the other designers and bloggers by visiting the One Room Challenge website. So many amazing transformations are under way!